I think anyone on any level will be quick to admit that making money at tournament fishing can be quite the uphill climb. 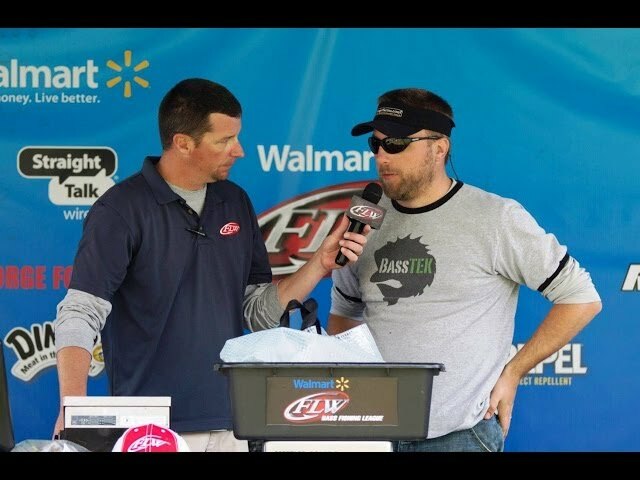 So I am going to share some of my tips on things you can do to keep your expenses down based on my tournament fishing, specifically last year’s Great Lakes BFL season where I finished 7th in the points in my first season in that circuit. So like I mentioned, you can apply this to most any circuit, but I like the alliteration of BFLs on a Budget! For me, most of my savings comes from my lodging decisions. When I can, I like to stay at campgrounds near where I am fishing and on the water if possible. The nicest campgrounds are usually much cheaper then the lowest end of motels, meaning I can usually camp for an entire practice and event for what many guys spend for one night at most motel/hotels. Not to mention the cost effective motels are often not the newest, cleanest or most secure. Campgrounds have awesome parking situations, plus I feel like they are pretty safe and secure, there are always exceptions, but for the most part, they are like communities where everyone watches each others stuff. Often you can call and get a pretty good rate at campgrounds when you let them know all you need is electric hookup & don’t need full RV hookup. Some people like tents, but for the most part, I make a bed in the back of my SUV, that way I don’t have to get up early on tournament days to pack up and worry about airing out a dew covered tent when I get home. My bed consists of dense foam camping mat, paired with various layers of sleeping bags and blankets depending on weather. I also like the security of sleeping in a vehicle connected to my boat, like a built in alarm system for my gear. Basically, half my vehicle is a bed and the other half is gear storage for stuff that isn’t in my boat. The next big piece is to plan ahead for your food. 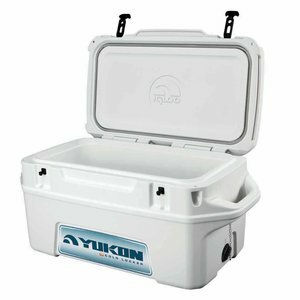 I have a big Igloo Yukon Cooler that I fill with drinks, food & ice before I leave home. I pair that with a brown grocery bag of bread and other dry goods and I am good for my trip. My cooler will last about 4-5 days without having to buy more ice. The ice keeps lunch meat, cheese, sausage sticks, yogurts and other items which keeps a nice variety. That paired with my dry goods, granola bars, nuts, jerky and other reasonably healthy snacks. This ends up being so much cheaper and healthier then fast food or gas station offerings. Getting your food and drinks from grocery stores or a Walmart is much more cost effective then buying single drinks or snacks on a daily basis from a convenience store. Just about any snack or drink is less then half the cost when bought in carton quantities over eaches. The next biggest bucket of savings is doing what you can to be smart with your fuel usage, so if you can leave early enough that you can keep your tow speeds down that will save a chunk of cash. Also, putting in two sun up to sun down days on the water is way cheaper then 3-4 for days of just fishing 9hrs. One of my key components is too make sure my batteries last as much as 14 hours if needed and my Minnkota on board DC charger does that. It recharges my trolling motor batteries from my outboard once the starting battery has been topped off. I also try to put together a pre-fishing game plan for the few days I have, so that I am being smart with the miles I put on the boat and SUV. Having a buddy to travel helps as well and often you can have each other’s backs as things come up. Hope these tips are helpful or inspire some new thinking or ideas for some of you. Let’s face, unless you are one of the few anglers that wins an event in a season, cashing checks likely won’t cover your expenses if you are spending $90 a night on a hotel and another $30-40 a day on food for every practice and event day, the math just doesn’t work out. 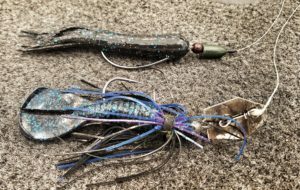 When the water temperatures plummet in fall, tournament bass angler Rich Lindgren employs numerous cold-water tactics, relying largely on one “jack of all trades bait” called the Kompak Craw for finicky bass in waters below 50 degrees. Lately, he’s been fishing Evolve Bait Co.’s Kompak Craw on a thin wire 4/0 EWG shaky head and says it recently out-fished the stalwart tactic of dragging tubes over rocks for fall smallmouth an impressive 13 to 1. Lindgren says the shaky head routine is a go-to for cold, clear waters less than 15 feet deep. Anything deeper and he’ll fish the Kompak Craw as a trailer on a BassTEK tungsten football head jig. 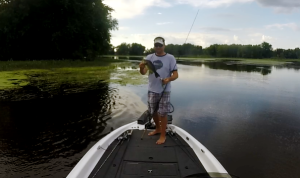 There’s nothing like knocking helmets with bass in deep water. Football head jig aficionados will tell you they live for the ‘thump.’ And while effective on deep structure bass all season long, the football head bite definitely comes alive in fall and early winter, typically around sunken islands, isolated rock piles, points and ledges in waters from 15 to 40 feet. To find these high-probability areas, Lindgren says he studies digital GPS mapping and uses Humminbird Side Imaging to look for fish on these deep water spots, marking waypoints for precise casts. 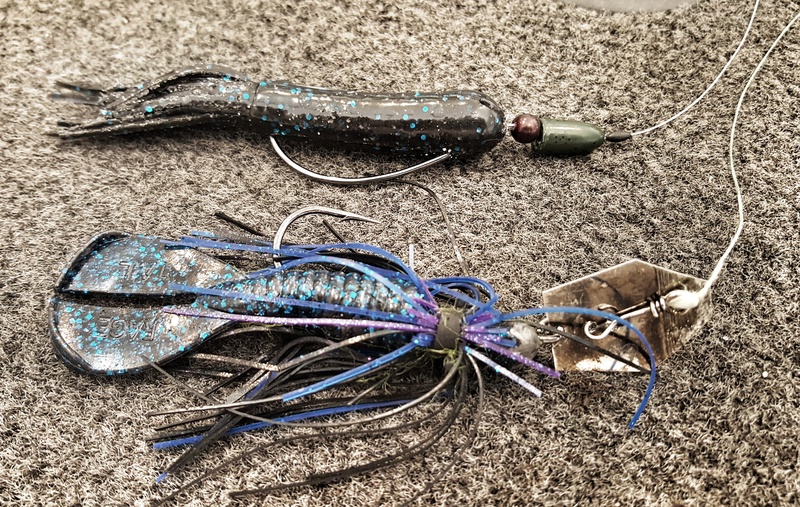 “During summer months I’ll fish a BassTEK football head jig with large, flappy craw trailers, but as the water temps go down, you really need something subtle. Fish are moving slower and they won’t eat if it takes too much energy. The Kompak Craw is precisely the thing, whether I skewer it onto a football head jig with silicone skirt, or my favorite, a combination silicone and hair football head jig. Hair moves in a way that mimics life even at a standstill in cold water,” says Lindgren. On natural lakes – especially those of the Midwest – Lindgren searches for remaining green weed clumps in 8 to 10 feet of water, relying on a finesse jig to slowly and methodically find willing largemouth bass. During cold bluebird skies and cold fronts, bass will cling tight to cover – especially weed mats and clumps – for warmth. That’s when Lindgren turns to the Kompak Craw for punching right into the bedrooms of big, lethargic bass. Lindgren fishes the bait on a straight shank 4/0 flipping worm hook with weight stop and ¾ to 1 ½-ounce tungsten flipping weight, tied to 22-pound fluorocarbon for clearer waters or 50-65 pound braid in dirtier waters. Spool that heavy line up on high speed reels and either a Dobyns DX795Flip or 805 Flip/Punch depending on how heavy the cover. Whether we are talking GPS, sonar, depth finders, fish finders or whatever you want to call them, this is a great time of year to learn a few things on how to set them up and get the most out of your electronics. Let’s face it, today’s modern GPS units have come along ways since the first basic LCD Fish Finders hit the market years ago. I am no expert on today’s modern electronics, but I make an effort to learn as much as I can, and I find a great way to learn is to check out tutorial videos on YouTube. Manufacturers like Humminbird, Lowrance & Garmin make some good videos, but there is also some great stuff put out there by Pro Staffers and general users. Here are a couple of my favorites, if you have some good ones or find some good ones, post a link in the comments below! Doesn’t hurt this guy had super sweet Dobyns Rods to feel those smallies either! Hope a few of these videos and others that you search on YouTube help you find and catch more bass! There are a ton more videos on how to setup sonar, mapping, updating software, managing waypoints and the list goes on and on…. is to always be prepared with all the tools that you need to do the job. stay at the hospital – or worse. dangerous fishing and trawling work, lives are always on the line. may even be putting lives at risk. currently operating on the modern international market place. Hey all, just wanted to share with you a bait that is quickly becoming a go to bait for me. It is something that I picked up last year to be a punching bait and now is proving to be more versatile then I could’ve hoped. The bait is the Kompak Craw from Evolve Baits. If you don’t want to read the whole blog post and have a short attention span like me, just watch the quick video. I show several rigging techniques in this video. For those that want every detail, keep reading! Last summer, I had excellent results using the Kompak craw behind 3/4 – 1oz flipping milfoil on lakes like Minnetonka and others, honestly kind of what I expected based on first glance of the bait. Then in September, I was looking for a follow up to my sweet beavers down in La Crosse to go back through areas and show the fish something new. My eyes were opened to the potential of this dimunitive craw when I went through an area after going back and forth twice with a beaver only to catch 3 bass including a 4lbr on the Kompak craw on my 3rd pass and my partner not getting a bite on his offerings. This gave me confidence to keep flipping this craw on lighter 3/8oz weights to wood, cut banks, etc and caught both smallmouth and largemouth. Fast forward to November and December last year, where a buddy an I found deep schools of smallmouth on a river in 25-25ft of water. Football jigs worked deep with just about any trailer worked until the water temps dropped into the 30s. I then rummaged through my options to find a subtle trailer, after trying a couple, the Kompak craw became the deal on the back of a 1/2oz football hair jig. I continued catching nice smallies and occasional walleye on the Kompak craw through the winter on a different winter location, by presenting them on 3/16oz EWG Football Shakey heads. Fast forward again to this spring, fishing pool 2, getting a few bites but not what I was hoping or expecting. After scouring a harbor with my usual offerings, I pick up a Kompak craw rigged on a Jika Rig and catch a 4lb fish plus several other bass in water that I and another boat just fished pretty hard. Fishing the Kompak craw on the Jika rig and small texas rigs has been in a regular mix for me so for this year, catching bass on little lakes in MN, the Mississippi river from Minneapolis to La Crosse and all the way over to Lake Winneabgo. There are a lot of good plastics and baits on the market and most of them have a time and place, but I think the Kompak craw is something for you to try, it is quite the versatile bait and the bass just seem to eat it! Don’t take my word for it, just ask the fish! So recently a fishing buddy and I were going back and forth on top jig colors for a side project we are working on. We spent quite a bit of time going back and forth, so I decided it may be easier to poll a larger audience to confirm or debunk our assumptions on what colors bass anglers across the US favor for their flipping jigs. It started out as a simple survey I put together, but responses came in rater quickly and exceeded the limit of the free Survey Monkey account. So I am writing this post to share the results from the first 100 responses which only took a few hours to get and now we have hundreds of responses I cannot access until I pay to upgrade. So my thought, is to share the initial results here on my blog and invite more of you to participate. 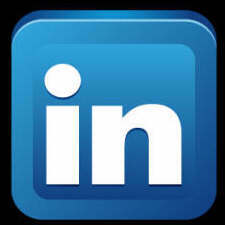 Once I hit a larger threshold of responses, I will pay the fee and then sharer the larger results with all of you. So please take this survey, if it takes more then 60 seconds you are probably over thinking it. Also, consider emailing, sharing, this blog post and results with your fishing friends so we can gather as much data as possible. So below are the 1st 100 response result summary and below that the chart that was posted to survey. If nothing else, I hope this helps new anglers spend their money wisely on picking jig colors! emergency restocking for my early winter bass fishing. light bites in cold water. My rod of choice is a Champion Extreme DX 744 from Dobyns Rods. Here is a video of a buddy & I catching some smallies with this deep football hair jig technique – Watch Video. cranking rod like the 704CB or 705CB from Dobyns and fish them on 10-12 lb fluorocarbon. So once you fill your hunting tags, consider getting out on the water and trying this dependable One-Two Punch! Oh yeah, Have a Merry Christmas!!!! Have you heard about the new 10XD? UPDATE 1-10-13 – Stike King 10XD are available in online stores, like here! If you are plugged into bass fishing, you have probably heard about the last FLW Open event won on Lake Sam Rayburn, where on the last day Phil Marks blew away the field and caught several of his bigger fish on a new Strike King 10XD super deep diving crankbait prototype. Get some more details here on W2F. Among bass fishing circles, the Strike King 6XD is already largely considered the deepest diving stock crankbait out there. Not to mention KVD and many other pros have cashed a ton of checks on the 6XD. The new 10XD is much larger then the 6XD as you can see in the picture above, but word on the street is that it is not much harder to crank in then a 6XD, DT20 or DD22. I am not a deep cranking aficionado by any means, but I am baffled that it took this long for something like this to come to market. I mean we are already going big with swimbaits and giant worms, why has it taken this long for a monster deep cranker like the 10XD? And are you going to jump on this bait or are you going to hold out for the 12XD or 15XD? Also, better question, what depths are attainable if you long line a 10XD? Last parting though, this 10XD on 15-20lb fluorocarbon should be a Falcon Lake Bass Killer! Kompak Craw Review & Evolve Contest Winner! Those that have been following along on the blog for the last few months, you are aware of some contests and product reviews in the works with Evolve Baits. Of the samples sent, I was immediately attracted to the Kompak craw. While I consider myself a pretty versatile angler, when permitted I will always look to power fish with jigs and soft plastics. At first glance, the Kompak craw can seem pretty simple and unassuming as a craw bait. Upon further inspection, there definitely was plenty of thought that went into this craw design. My first inclination was to put it behind a hefty tungsten weight and flip it around heavy vegetation. The bait has a long body for it’s small stature, allowing you to put a large 4/0 flipping hook into the bait and it puts the point right in the back of the bait, where it should hook a large percentage of fish. Also, there is a slight bias to the bait front to back where the hook point goes, allowing a little extra meat for you to hide a big hook point. The subtle appendages also move enough water to get noticed in the thick cover. A comparable bait that I like to use for similar presentation would be the old Yum Big Show Craw. Although the soft yet durable plastic of the Kompak craw holds up much better then the Big Show craw. So the introduction of the Kompak craw is welcomed in my boat, as it appears to be a better bait and Yum appears to have stopped producing the Big Show for the time being. If you love to punch milfoil or other vegetation with a craw, this is a must try bait! The setup I used to fish the Kompak craw was Punch rigged with a 4/0 Trokar flipping hook, 20-25lbs fluorocarbon, 1/2-1oz Tungsten flipping weights, and predominantly rigged on my Dobyns Champion 805 Flip/Punch rod, when I would fish it on the 1/2oz weight, I would drop down to my Champion 734C. In practice for the Madison Chain event, the Kompak craw produced several bites and fish worked in milfoil and docks. Our flipping bite fell apart during tournament, but I am excited to try them this weekend down on the Mississippi River! I also hope to give the DarkStar swimmer as a go as well this weekend, check back in the future to learn more about the Swimmer and VibraGrub. Merideth Gifford is our big winner, so here is the selection of Vibra Grubs, DarkStar Swimmers & Kompak craws she will get a chance to tempt Oklahoma Bass with! Hopefully Merideth will be posting some pics to my Facebook wall with here results soon! Thanks again to Evolve Baits for their support of this blog, you can find most of their baits online for purchase here. Recorded the Fantasy Fishing Insider podcast earlier this morning, hopefully it edits and drops in time for all of you to listen in, but if not, here are my picks. Last Saturday was so beautiful, had to get out on Pool 2 if only for a few hours. Tried some new water, for the most part unproductive, caught a few fish though. I am also excited for the Minnesota Bass Expo this weekend, looks like it is going to be a really cool show, check out the list of vendors. I will be there from 4-8pm on Friday, probably find me walking around or hanging near the TBF or Kruger Farms booth. FYI – Kruger Farms had some killer deals at the Northwest Sportshow, do yourself a favor and stop by their Bass Expo booth, they might surprise you, plus they should have some Dobyns Rods on display if you have not checked them out yet. Don’t forget about the Aquateko contest, you still got 12 days to enter that contest for free tackle! Last but not least, I did another quick video showing my system for organizing and storing my soft plastics for bass fishing. Check out the video.